If you’re a scientist who hopes to dedicate the rest of your life to developing and proving a revolutionary scientific theory, there’s a good chance you’ll never get to see your work’s eventual success. We all know of Rosalind Franklin, the female powerhouse who helped unravel the secrets of the human genome but passed too early to be awarded the nobel prize. And recently, brilliant theorist Ronald Drever, passed in March- never to see the extent to which his work on gravitational waves became a worldwide story of success. In fact, scientists working on Drever’s biggest project- the Laser Interferometer Gravitational Observatory (LIGO) – were recently awarded the Nobel Prize in Physics. LIGO was truly a pipe dream. The experiment was initially approved in 1992 and accounts for the largest investment the National Science Foundation has ever made. The risk was pretty large, the scientific community was skeptical, and those making financial contributions were nervous. But through the dedication and persuasion of scientists, the experiment was able to continue. 1.2 billion years ago, long before the scientists of LIGO began their endeavours, two black holes collided. In about a fraction of a second, these two black holes let out a final gasp- a gravitational wave along with energy 50 times the power output of the entire visible universe. In 2017, the scientists of LIGO measured and observed the gravitational waves produced by these black holes. Unlike most observatories you know of, LIGO is not a huge telescope pointing at the sky, it isn’t even looking to capture images of the sky– it’s looking to feel it. LIGO simply cannot capture images or sounds. Gravitational waves exist outside the electromagnetic spectrum- this means they can’t be perceived through sounds or sight. 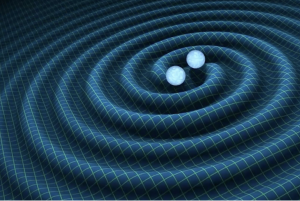 Instead, gravitational waves are found through a specific physical signature. In the actual experiment, two mirrors are positioned a certain distance apart within the LIGO interferometer, when gravitational waves pass through the system the mirror’s, the distance between the mirrors changes by an infinitesimal amount. This change in distance is- amazingly- predicted with Einstein’s theory of relativity. Ronald Drever and hundreds of other scientists dedicated their life’s work to the gravitational waves experiment. And thanks to their many years of dedication, Drever, these scientists, and the nobel laureates have led us into a new era of astronomy. Today, the LIGO detections are ongoing and promising, proving Einstein right 100 years after his initial prediction and opening up a world of gravitational physics previously seen as inaccessible by the scientific community. These experiments are just a small part of the amazing work happening around the world as scientists work actively to prove more about our understanding of the universe, attempting to open even more doors for discovery and the overall improvement of human life. So the consensus is pretty clear— it’s worth it. “MIT.” LIGO Lab | Caltech. Accessed October 30, 2017. https://www.ligo.caltech.edu/. Rees, Sir Martin. “Gravitational waves: Einstein was right – and this announcement is the scientific highlight of the decade.” The Telegraph. March 12, 2016. Accessed October 30, 2017. http://www.telegraph.co.uk/science/2016/03/12/gravitational-waves-einstein-was-right—and-this-announcement-i/.